Artist's illustration of asteroids headed toward Earth. A strike by a medium-size asteroid could change Earth's climate dramatically for a few years, making life difficult for people around the world, a new study suggests. Such an impact on land (as opposed to at sea) could cause average global temperatures to plunge to ice age levels and lead to steep drops in precipitation and plant productivity, among other effects, researchers said. Bardeen and his colleagues modeled what would happen to Earth's climate if a 0.6-mile-wide (1 kilometer) space rock plowed into one of the planet's landmasses. Such an impact would probably gouge out a crater about 9 miles (15 km) wide, throw huge amounts of dust into the atmosphere and trigger large-scale fires that lofted lots of soot into the air, provided the strike didn't occur in a desert area with little vegetation, Bardeen said. The material lofted after this hypothetical asteroid strike would stay in the atmosphere for a long time — about six years in the case of dust and 10 years for soot, according to the researchers' results for the "worst-case scenario" (which assumed widespread fires). The atmospheric soot and dust would also reduce the amount of sunlight hitting Earth's surface by up to 70 percent for the first year or two, Bardeen said. As a result, average global surface temperatures would cool by 14.5 degrees Fahrenheit (8 degrees Celsius), "which is about the equivalent of the ice ages," Bardeen said during his AGU presentation. The bulk of this temperature drop would occur on land, he added. But effects would be felt in the oceans as well; sea-ice cover would increase, and water has a high thermal inertia, so changes in ocean temperature would last for a relatively long time. For example, the team's models suggest that the top layers of the ocean would still be about 0.9 degrees F (0.5 degrees C) cooler than normal 15 years after the asteroid impact. The global cooling would also lead to a drop in precipitation of about 50 percent around the world, Bardeen said. "This is due to the lost heating and the lost temperature, so we lose convection; we don't have as many [weather] fronts," he said. The decrease in sunlight, rain and snow would lead to a roughly 50 percent drop in plant productivity — not good news for farmers and the people who depend on them (which is to say, everyone in the world). Crops in North America, Europe and northern Asia would be especially hard-hit, while agricultural lands in India, South America and Africa would not be affected as much, Bardeen said. So, the overall picture is not pretty. A strike by a 0.6-mile-wide asteroid could cause "a very severe global impact" for several years, Bardeen said. Bardeen and his team modeled the aftermath of an asteroid strike on land. But it's more likely that a space rock would come down in water, since oceans cover about 70 percent of Earth's surface. What would happen then? A 2010 modeling study by the late Elisabetta Pierazzo and her colleagues looked into this scenario, and determined that the effects on Earth's protective ozone layer would be dramatic. An ocean strike by a 0.6-mile-wide asteroid, the team found, would loft enough salty water vapor to destroy huge quantities of ozone, causing the surface UV index to spike temporarily to 56. Such high radiation levels, which have never been experienced in human history, would probably force people to stay inside during the day, Pierazzo said when the study came out. But an ocean strike would not have the same climatic consequences as a land impact, Bardeen said. "The temperature effects, the precipitation effects, the effects on plants — those would all really only come with the land impact," Bardeen said. However, the chances of an asteroid strike with serious global consequences seem remote, at least in the near future. To date, astronomers have spotted 879 near-Earth asteroids that are at least 0.6 miles wide, and none of them pose an immediate threat. Models suggest that these 879 represent more than 90 percent of the total population of such mountain-size space rocks in Earth's neighborhood, NASA officials have said. If a dangerous asteroid does line Earth up in its cross hairs, humanity doesn't have to sit idly by, just waiting for the end to come. 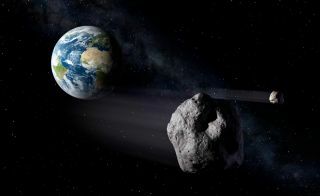 If the space rock is detected with enough lead time — ideally, a decade or more before a potential impact — it could conceivably be steered off course using one or more "kinetic impactor" spacecraft that would slam into the space rock, and perhaps a fly-along "gravity tractor" probe as well, which would further nudge the asteroid slowly over long periods of time. Destroying or disrupting the incoming object with a nuclear bomb is also an option, researchers say, especially if the threatening rock is extremely large and/or was first spotted shortly before its encounter with Earth.